Download "Transmission technologies for collective offshore wind farm connections"
3 3 Trafo Trafo Yy Yy Yy6 Figure 6: six-phase bipolar cable system, supplied by two conventional AC transformers in Yy and Yy6 configuration y l Figure 7 shows the pair of cables L- and L-, buried close to each other. Obviously, the current I in the conductor of the first cable (L-) running to the load returns via the conductor of the second cable (L-). A single pair of cables according to Figure 7 represents a two phase AC system transmitting instantaneous power pulsating with twice the frequency of the connected power system. The instantaneous power of the resulting bipolar sixphase AC system, however, is constant and just equals the active power. With n representing the nominal voltage of the individual 3 phase system, the resulting transmitted power S according to Figure 6 is: S 3 I. = n III. COLLECTIE OFFSHORE TRANSMISSION CONCEPT The configuration being assessed below consists of the following elements (see Figure 7): - platforms with offshore substations of individual offshore wind farms (); - the collection platform (); - and the offshore transmission line to the connection point with the onshore grid (3). The concept uses the 4 k AC cable design proposed by Nexans with integrated return conductor . 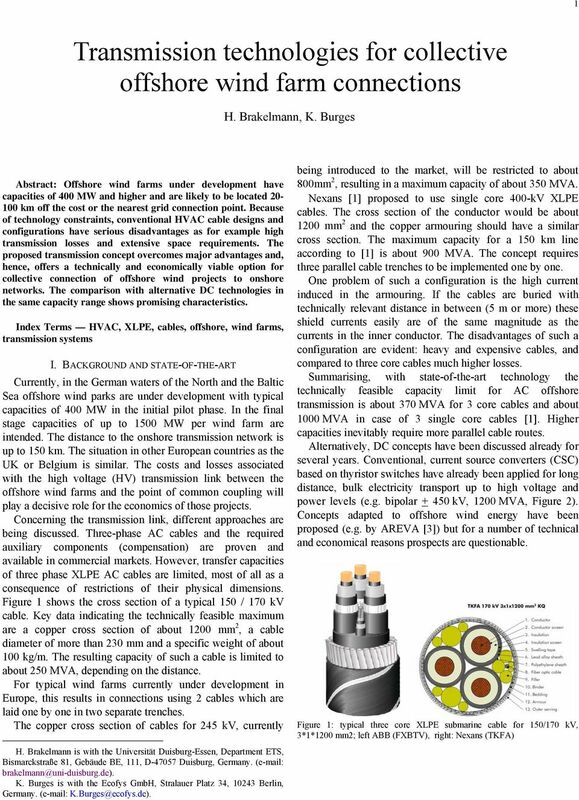 For the assumed transmission capacity of MW a copper cross section of mm would be required. Compensation is applied at both ends of the transmission line only. 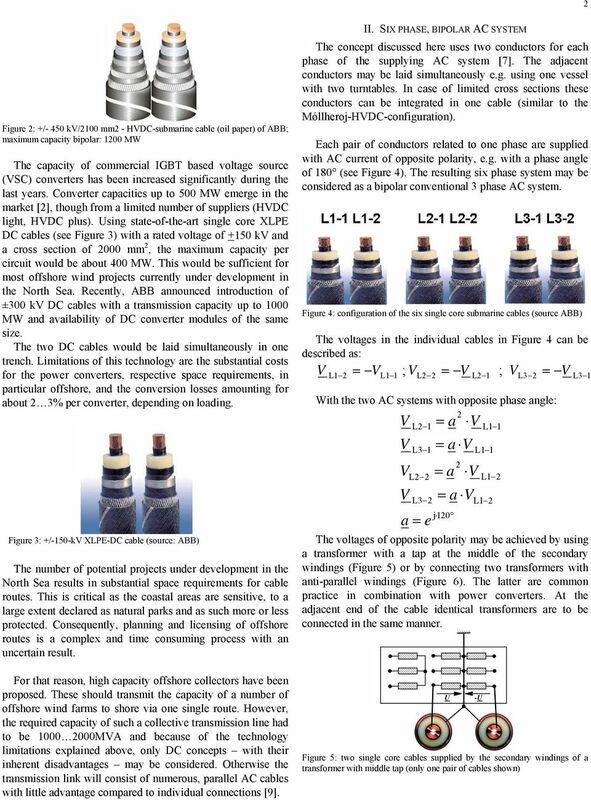 Alternatively, the two DC concepts (voltage source converter SC using IGBTs and current source converter CSC using thyristor valves) may be considered. The distances y and l in Figure 7 are assumed being 7 km and km, respectively. 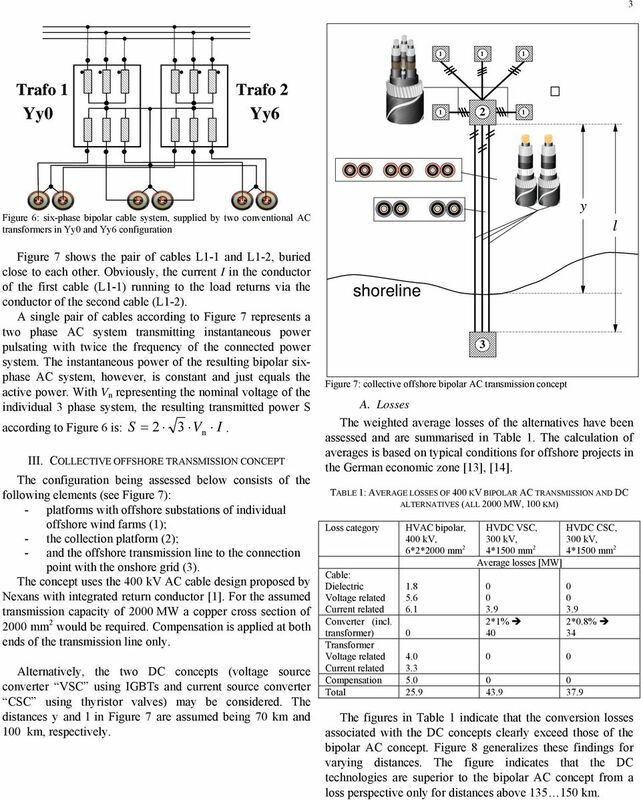 Küste shoreline Figure 7: collective offshore bipolar AC transmission concept 3 A. Losses The weighted average losses of the alternatives have been assessed and are summarised in Table. The calculation of averages is based on typical conditions for offshore projects in the German economic zone , . TABLE : AERAGE LOSSES OF 4 K BIPOLAR AC TRANSMISSION AND DC ALTERNATIES (ALL MW, KM) Loss category Cable: Dielectric oltage related Current related Converter (incl. HAC bipolar, 4 k, 6** mm transformer) Transformer oltage related Current related HDC SC, 3 k, 4*5 mm Average losses [MW] 3.9 *% 4 HDC CSC, 3 k, 4*5 mm 3.9 *.8% Compensation 5. Total The figures in Table indicate that the conversion losses associated with the DC concepts clearly exceed those of the bipolar AC concept. Figure 8 generalizes these findings for varying distances. 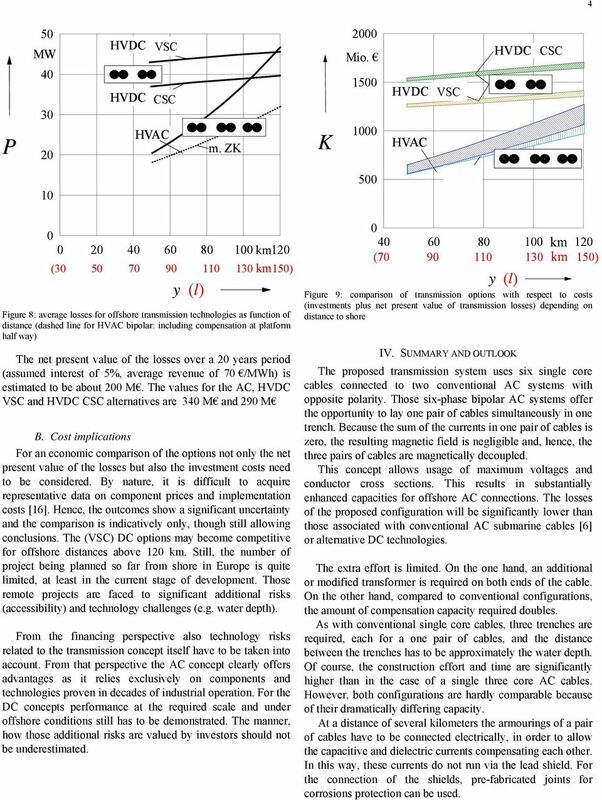 The figure indicates that the DC technologies are superior to the bipolar AC concept from a loss perspective only for distances above 35 5 km. 4 4 P 5 MW 4 3 HDC light SC HDC classic CSC HAC m. ZK K Mio. 5 5 HDC light SC HAC m. ZK HDC classic CSC km ( km 5) y (l) Figure 8: average losses for offshore transmission technologies as function of distance (dashed line for HAC bipolar: including compensation at platform half way) The net present value of the losses over a years period (assumed interest of 5%, average revenue of 7 /MWh) is estimated to be about M. The values for the AC, HDC SC and HDC CSC alternatives are 34 M and 9 M B. Cost implications For an economic comparison of the options not only the net present value of the losses but also the investment costs need to be considered. By nature, it is difficult to acquire representative data on component prices and implementation costs . Hence, the outcomes show a significant uncertainty and the comparison is indicatively only, though still allowing conclusions. The (SC) DC options may become competitive for offshore distances above km. Still, the number of project being planned so far from shore in Europe is quite limited, at least in the current stage of development. Those remote projects are faced to significant additional risks (accessibility) and technology challenges (e.g. water depth). From the financing perspective also technology risks related to the transmission concept itself have to be taken into account. From that perspective the AC concept clearly offers advantages as it relies exclusively on components and technologies proven in decades of industrial operation. For the DC concepts performance at the required scale and under offshore conditions still has to be demonstrated. The manner, how those additional risks are valued by investors should not be underestimated km (7 9 3 km 5) y (l) Figure 9: comparison of transmission options with respect to costs (investments plus net present value of transmission losses) depending on distance to shore I. SUMMARY AND OUTLOOK The proposed transmission system uses six single core cables connected to two conventional AC systems with opposite polarity. Those six-phase bipolar AC systems offer the opportunity to lay one pair of cables simultaneously in one trench. Because the sum of the currents in one pair of cables is zero, the resulting magnetic field is negligible and, hence, the three pairs of cables are magnetically decoupled. This concept allows usage of maximum voltages and conductor cross sections. This results in substantially enhanced capacities for offshore AC connections. The losses of the proposed configuration will be significantly lower than those associated with conventional AC submarine cables  or alternative DC technologies. The extra effort is limited. On the one hand, an additional or modified transformer is required on both ends of the cable. On the other hand, compared to conventional configurations, the amount of compensation capacity required doubles. As with conventional single core cables, three trenches are required, each for a one pair of cables, and the distance between the trenches has to be approximately the water depth. Of course, the construction effort and time are significantly higher than in the case of a single three core AC cables. However, both configurations are hardly comparable because of their dramatically differing capacity. At a distance of several kilometers the armourings of a pair of cables have to be connected electrically, in order to allow the capacitive and dielectric currents compensating each other. In this way, these currents do not run via the lead shield. For the connection of the shields, pre-fabricated joints for corrosions protection can be used. NSW Submarine Power. Cables for the future, delivered today. 2 Why measurement/inspection of the grounding system? 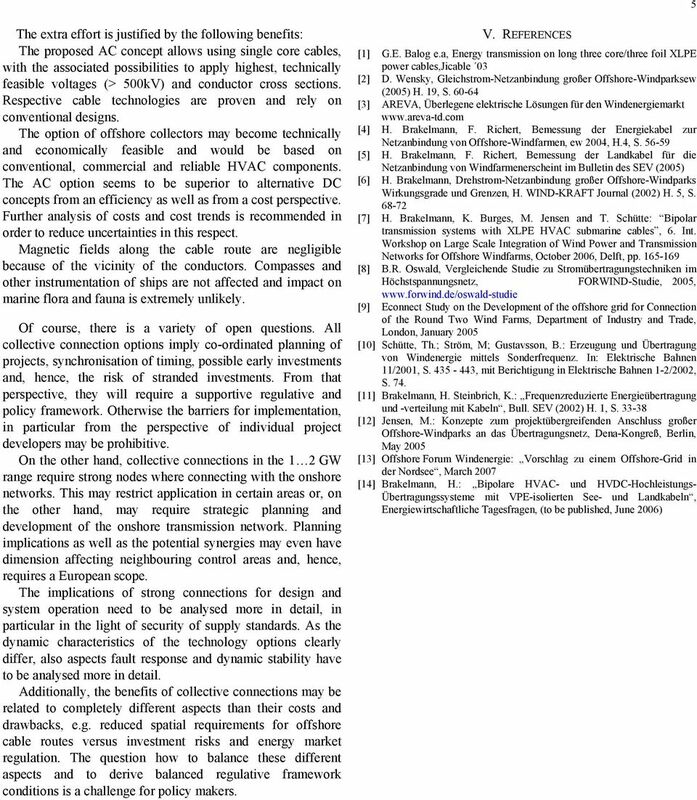 SUPERCONDUCTING CABLE SYSTEMS INTRODUCTION An aging and inadequate power grid is widely seen as one of the greatest obstacles to the restructuring of power markets in the United States, Europe and elsewhere. NSW Submarine Telecom Systems. Turnkey solutions for the future, delivered today. Comparisons of Soil Resistivity Meters Used with Pre-Measured Cable Sets. AKM Sydul Haque, Ph.D., P.E., ELK Engineering Associates, Inc. Comparisons of Soil Resistivity Meters Used with Pre-Measured Cable Sets By AKM Sydul Haque, Ph.D., P.E., ELK Engineering Associates, Inc. and Earl L. Kirkpatrick, P.E., ELK Engineering Associates, Inc.
Green and Secure. Challenges of increasing RES feed-in from a TSO perspective and from a power market point of view. René Müller 07.04.